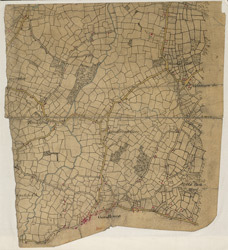 This laminated outline drawing of the Kentish Weald is dominated by regular field boundaries and unproductive enclosed land, depicted by open dotting. Buildings are infilled and blocked together in the main settlements of Goudhurst and Broadford. Yellow ochre and blue washes distinguish roads and waterways, respectively.